Concrete Engraving - Learn why engraving concrete can be so rewarding. Are you looking for highly decorative concrete? Well look no further. Concrete engraving can transform your plain, boring concrete into a work of art. With an experienced concrete artisan and all the decorative stencils available, your concrete floor can have just about any kind look you desire. 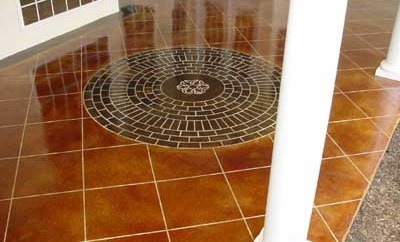 It's possible to engrave a picture, photo or logo you have right into your concrete floor. Do you like 3D images, no problem, check out the video at the bottom of the page. 1. Cleaning and doing the required concrete surface preparation. 2. 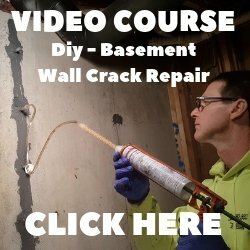 Doing any concrete repair, although some cracks are incorporated into the pattern when using aged stone or brick patterns. 3. Using concrete stain to add color to the concrete. 4. Engraving the concrete with the proper tools and the pattern you picked out. 5. Cleaning up and applying a concrete sealer. Color is usually added to the concrete with a concrete stain before engraving is performed although staining can be done after if you choose to. Using concrete acid stain creates beautiful color tones with uneven, mottled, variegated effects. Stained concrete surfaces can be very artistic with an experienced installer. Many unique designs and special effects can be achieved by intermixing different stains while they are still wet. One of the great things about concrete engraving is that it doesn't add any thickness to the top of the concrete. Added thickness can be an issue for concrete driveways and concrete patios where there are door openings. 1. The size of the area to be engraved. 2. The amount of cleaning required. 3. The amount of patching and fixing cracks. 5. The difficulty of the pattern being engraved into the concrete. 6. The weather if the job is outside. 7. The skill level of the engraving contractor. A small job with a simple pattern could be finished in two days. After a design like cobblestone, tile, or brick has been engraved into the concrete it will stay for the life of the structure. The color change over time with the concrete stain is hard to predict, but with proper care and regular sealing the color should remain close to new. 1. Cleaning with a hose and water to remove any dirt. 2. Promptly removing any grease or oil so it won't stain. 3. Re-sealing every 3 - 5 years to keep the surface protected and looking like new. Engraved concrete is a great choice for existing concrete. The decorative options are limited only by your imagination and the creativity of the installer. 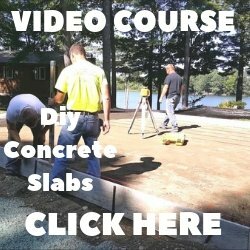 For some other concrete design ideas click on the links below. 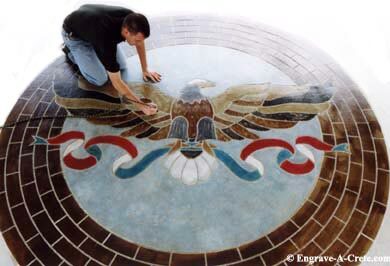 Engrave-A-Crete has a great free catalog you can download. There is a lot of good ideas for patterns to look at. It takes a minute or two to download but it's well worth it.